Dementors have never been so immortalized other than in the Harry Potter Series. To those Harry Potter fans out there, you know how much Remus Lupin described it in such graphic detail, “Dementors are among the foulest creatures that walk this earth. They infest the darkest, filthiest places, they glory in decay and despair, they drain peace, hope, and happiness out of the air around them... Get too near a Dementor and every good feeling, every happy memory will be sucked out of you. If it can, the Dementors will feed on you long enough to reduce you to something like itself... soulless and evil. You will be left with nothing but the worst experiences of your life." I’m a huge fan of the third Harry Potter novel, so you can just imagine my horror… I mean, shock, when I saw a similar one in Riga, Latvia’s capital. Walking around Old Riga, you’ll immediately get a feeling that everything and anything is walkable and within reach. All the historical buildings, must-visit markets, and landmarks, are seemingly accessible on foot, rather than doing a hop-on hop-off bus. Like for example, visiting the famous Three Brothers, which is inside the Old Town on Maza Pils street, is clearly walkable. Or what about visiting the House of the Blackheads, which is also inside the Old Town at the Town Hall Square. It’s this 1334 place is like the Eiffel Tower version of Riga, a famous landmark. But oddly enough, if you are like me, who enjoys architecture, but prefers a bit of “surprise” here and there, then Old Riga seems like a very predictable EU city already, not until you find the Ghost Sculpture. As we were aimlessly walking around the labyrinth of streets in Old Riga, we were looking for a different landmark when we suddenly spotted this ghostlike creature standing still. In a street with zero people, and almost misty weather, you kind of hear some Dementor background music playing inside your head, and you instantly feel like it’s going to be a Birdbox movie scare or something. It’s not the same as a cemetery level of chills, but it sure looks a bit eerie and somewhat evocative. Created by a local artist known as Leva Rubeze, you’ll be surprised to see it near a really small street, just near some old garage, with a big wall behind it. It already looks creepy in the afternoon, especially with a cold misty weather, but imagine seeing this Ghost Sculpture at night? Definitely worth taking a picture with, right? 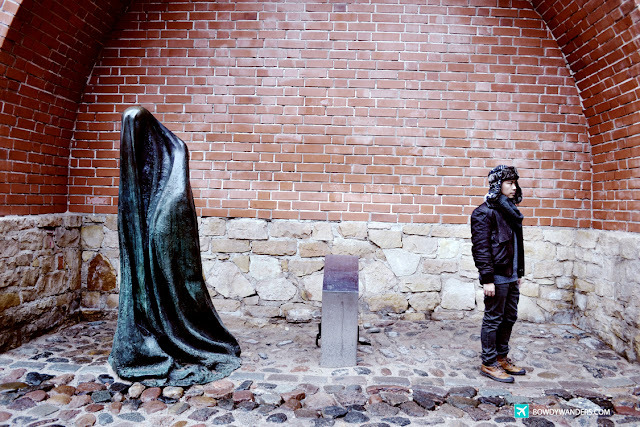 Riga is interesting to explore, be it via a (free guided tour), a DIY trip, a bike ride tour, because it’s so easy to do a recap of all the recommended places her, even if it’s as small and as spooky as the Ghost Sculpture. Maybe it’s not as all out scary as the fictitious Dementors after all, but then again, it’ll be so awesome to visit this in a cold winter rainy evening, just to give you the right kind thrill extravaganza! Yes, you aren’t too scared right?